Today, IAM Magazine will publish the ROL Group’s third annual report on the brokered patent market. The article will appear in the January issue of IAM, and is now available on our website. We wanted to use this opportunity to highlight two key points: the types of entities that are buying and selling patents and how their behavior has changed over time as well as the tech areas that are selling. Now available for download from our website (updated March 19, 2015). The chart below is similar to one in the IAM article; however, here we compare the sales data from January 1, 2013 through July 7, 2014 to the sales data from January 1, 2009 through December 31, 2012 to highlight changes over time. The largest change is the drop in the percentage of total purchases by NPEs. The decrease in NPE purchasing activity likely relates in no small part to a decrease in buying by Intellectual Ventures while waiting to fund its Invention Investment Fund 3. We have started to see Intellectual Ventures resume buying, so the NPE number may rise in the coming year. 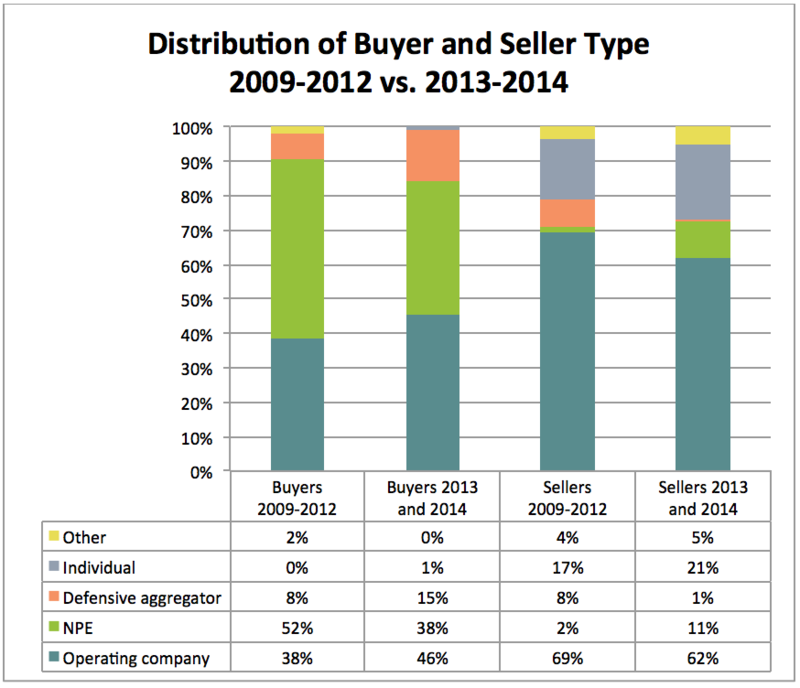 Decreased NPE buying increases the percentage of total purchases for other entity types and moves operating companies into the number one spot for buyers. On the sellers side, NPEs were also seen to sell more, though no NPE sold more than one package, and defensive aggregators sold less than in previous years. When we receive a package for sale, we classify it into one of 16 general technical categories and 98 sub-categories. Using the general technical categories, the sales data demonstrates the market being skewed towards internet computing. 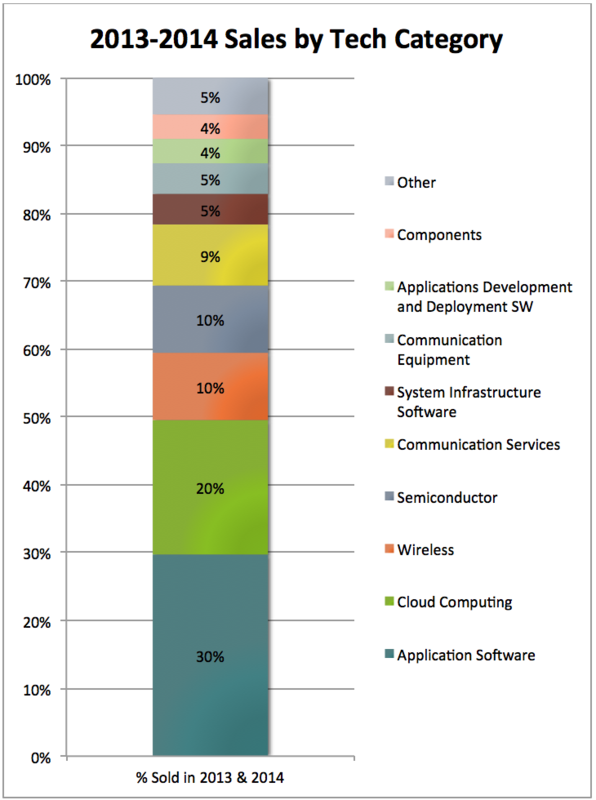 Application software, cloud computing, and system infrastructure software account for 55% of the sales. It should also be noted that the listing rates for tech categories are related the sales rates, but neither the rates nor the ranked technical category order are the same. Please take a look at the full article for many more details including analysis on brokers, package flow, prices, package sizes, sales rates, factors that increase sales rates, and the total market size.